Last year’s Alltech FEI World Equestrian Games brought €102 million in “value added” to Normandy and €368 million for France, organisers say. The “value added” figures were calculated on the direct, indirect and derived effects of the event from visitors travelling to Normandy specifically for the Games, including transport, accommodation, restaurant, leisure, etc.). An impact study taking into account the economic, social and environmental effects of the Games was carried out by research professors from IFCE-INRA (French Institute for Horses and Riding and the French public agronomic research institute) which has developed a scientific assessment programme for equestrian events. Some 2300 surveys were conducted with spectators, officials, athletes, employees, volunteers and Norman residents. IFCE-INRA researcher Céline Vial said the economic returns based on the event’s budget of €79m were “excellent”. Those surveyed also placed a monetary value of nearly €45m on the social scope of the event, and those attending the Normandy 2014 event gave it a satisfaction rating of 7.8 out of 10. The FEI has assessed the economic impact of Normandy 2014 at €368 m for France, which is considerably higher than for the 2010 event. 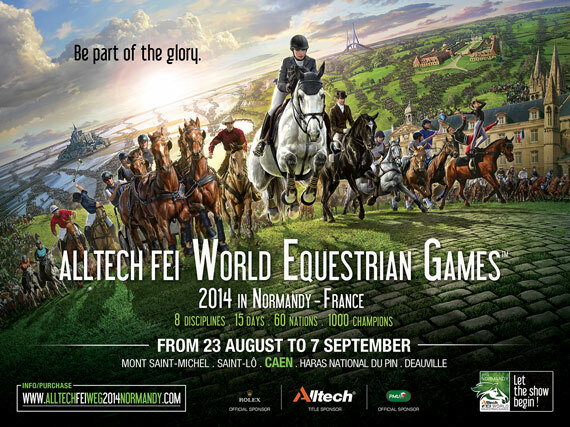 The World Equestrian Games in Normandy also incorporated 18 medium and long-term development projects. Some of the projects include improvements made at the Le Pin National Stud, the Normandy Business Centre in Saint-Lô, and investments in Hippolia in the Calvados areas. Improvements were also made to the Caen Exhibition Centre and the Vallée de l’Orne, and over 15 months, 300 cultural, athletic and educational initiatives were held as part of the Elan des Jeux programme in hundreds of equestrian centres, leisure centres and primary schools around the region. Some 4000 children were able to discover horse riding and related activities. During the fortnight of the Games, Normandy came together to promote its regional know-how at the Games Village for 230,000 visitors. Laurent Beauvais, President of the Normandy 2014 Organising Committee and President of the Region of Lower Normandy: “Normandy rose to the challenge of hosting the World Equestrian Games for the first time in France at some of its most emblematic sites. It took the risk of being innovative with a territorial project and has reaped the rewards.